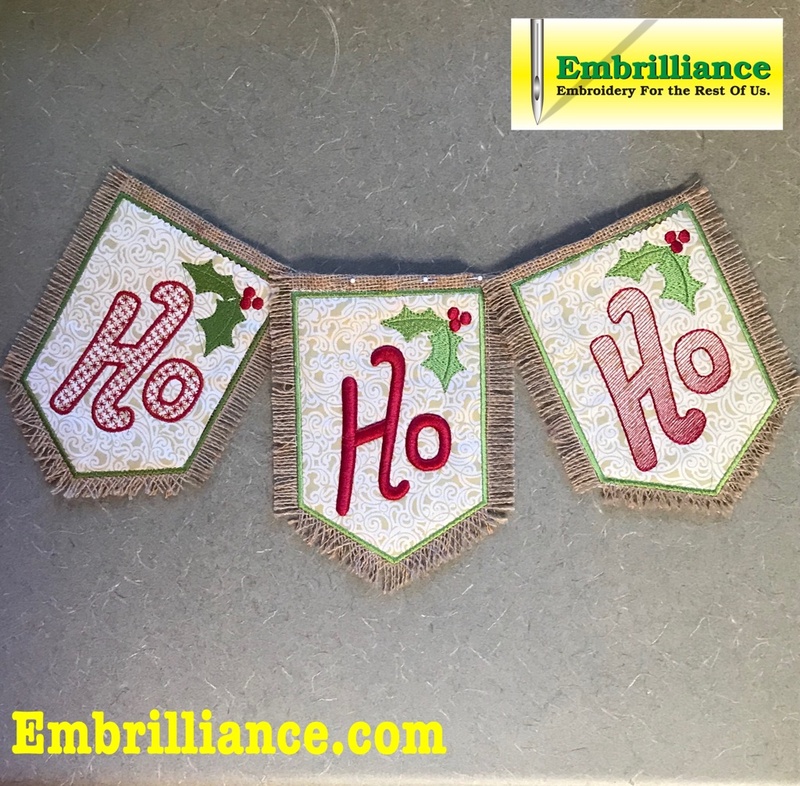 Our traditional pennant design has been created for a 5×7 hoop and is available in 3 different styles of stitching for each of the “Ho”s to match your style. 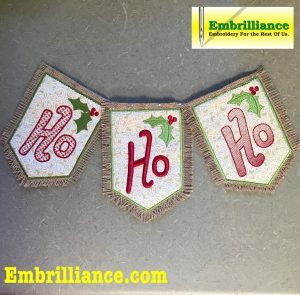 This design was digitized by Lisa Shaw for Embrillance using the StitchArtist software. As always, we include the BE working files in the download so that you can open them into your Embrilliance software and save to the machine format that you need! The first pennant shown above is done with a motif fill and a skinny satin border. In fact, the motif was actually created in StitchArtist by combining two different motif patterns! If you have StitchArtist, you can select the motif object for the Ho and see the properties of the motif fill. Motif fills are part of StitchArtist Level 1 and you can combine and adjust any of the 150 motif patterns to create an infinite number of fill styles! 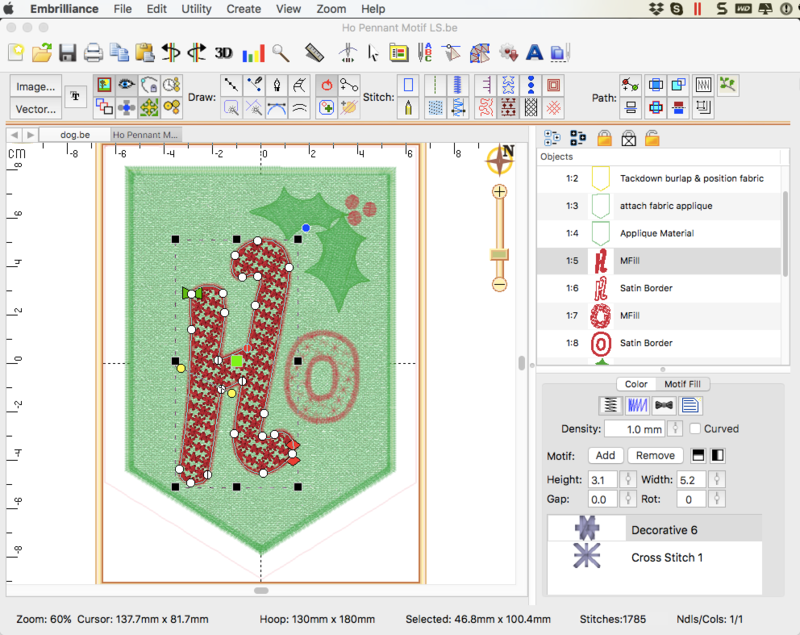 The second pennant is created as a 3D foam design using StitchArtist Level 2. StitchArtist was nominated for a Best New Product Reggie award this year for our 3D foam underlay – we were also nominated for Best Customer Service. If you are reading this before Dec 15, 2018, you can still vote! Visit our NEWS blog for details and links to vote AND Thank You very much! The holly berries are also 3D foam in this pennant. They were adjusted to be a traditional satin in each of the other 2 pennants. The third pennant is done with a light sketch type fill and a back stitch outline. Our November blog post also had a sketch fill design for the apple. You can create sketch designs in StitchArtist Level 1, and the gradient option which gives a weight to the letters is found in StitchArtist Level 2. The holly leaves have a carving line added to them which is part of StitchArtist Level 3. This adds a bit of interest to the leaf without having to draw separate objects. Another note on the creating of all three designs. If you expand an look at the object pane, you will note that some of the objects were named with their job. Lisa did this so that if she came back to this design next year, she would know the jobs of each of the objects. Also the nice thing about working with your BE working file in StitchArtist, going from a motif object to a sketch object was as easy as changing the stitch type for each. Keep this in mind when you are digitizing so that you don’t have to work so hard 🙂 Just remember open your working file and save as a new name so that your original is still intact! For those that have Embrilliance StitchArtist, you can view all of the objects with their stitch properties by going to Create mode! Use these beautiful embroidery design working files as inspiration and guidance to create your own pennant embroidery designs with motif fills, 3D foam or in a light sketch fill. Happy Holidays! Posted 4 months, 2 weeks ago at 12:44 pm.